One of my favorite running areas outside of Addison County has always been the Mad River Valley, where some of my extended family lives, and has a trail network at least as varied and beautiful as that which we have in the Middlebury (as in Middlebury VT, the 11th best town in the country to live, according to Outside Magazine!) area. One of the limitations on running in “the valley” has been my lack of knowledge of much of the trail network, but while looking online for appropriate trails, I stumbled across the existence of a guide to the trails there, available at a variety of stores. So, on Saturday morning, while enjoying the food and sights of the Waitsfield Farmers’ market, I picked up a copy of this map at the Tempest Bookstore in Waitsfield, one of many locations where this guide can be purchased, and studied it to look for an interesting run. 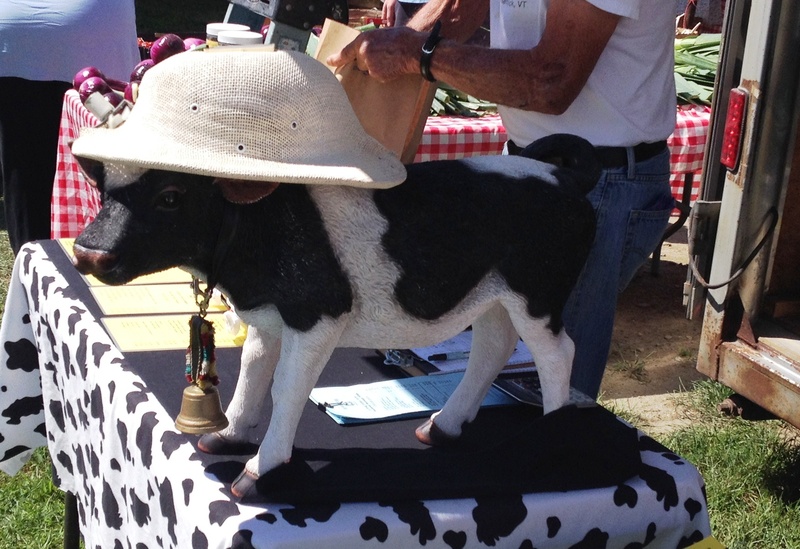 As an aside, the Waitsfield Farmer’s Market is a great place to spend a little time on a warm Saturday morning – while it does have some of the most beautiful veggies in the world, as one would expect, it also has a wide variety of specialty foods, crafts, and prepared foods. One cow decorating the booth of a butcher shop looked far happier than one would expect, given the circumstances. I knew I would not have time for a particularly epic run, given my other commitments, and looking for an area where I could put in a decent 5 miler, I settled on a trailhead which I had previously noted, heading south from the Mt Ellen Access Road across from the Fayston Elementary School. According to my map, I would be looking for a section of the Catamount Trail which headed south until it rejoined the German Flats road 2 miles to the south. When I got to the trailhead, I didn’t see any of the blue diamond signs indicating that I was actually on the Catamount Trail, but did see signs indicating that I was actually on a section of the Mad River Path, a pleasant but disjointed collection of trails spread throughout the valley. 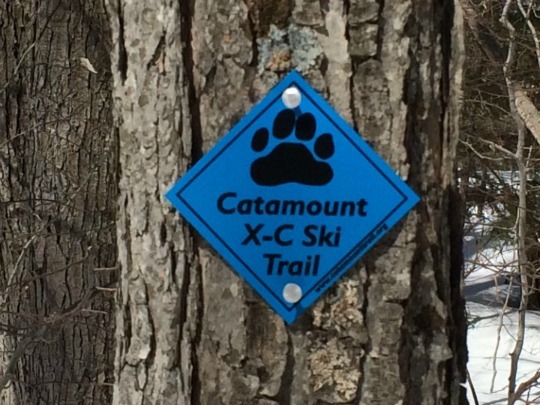 So, I was in the somewhat confusing position of holding one map, which failed to acknowledge the existence of the Mad River Path, and saw trail signage which had no mention of The Catamount Trail. Curious, to say the least! Oh well – they both are there and are both great trails – just run and don’t worry about it. 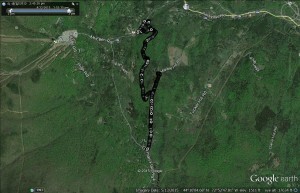 So, I followed the trail signs out of the parking lot, crossed a footbridge across the stream, and in about a quarter of a mile, my short section of the Mad River Path crossed the section of the Catamount Trail which I had planned to run on, and I decided to turn onto the Catamount Trail. This section of trail climbed gradually over the next mile or so, passing alternately through mature hemlock forest, and much younger hardwoods. 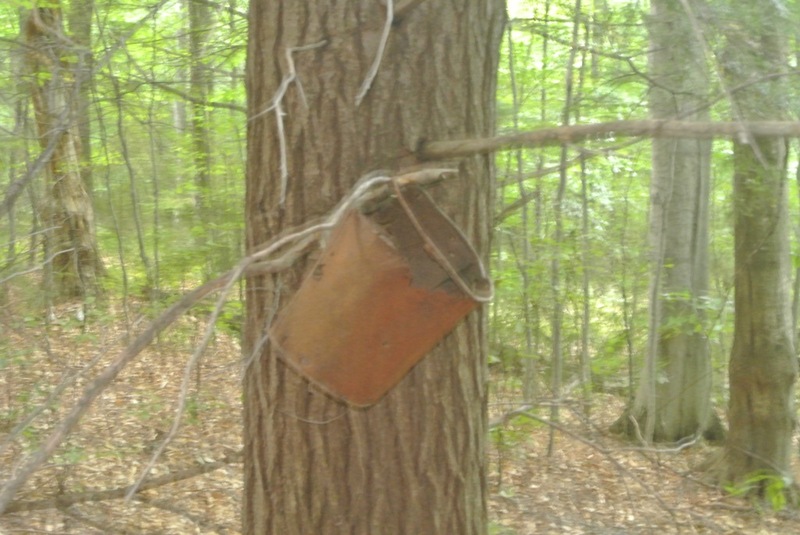 It seemed as if the tree varieties were hyper-sensitive to their exposure, and I suspect that the hardwoods had been more recently logged, although there were definite signs active maple sugaring operations, as well as old stone walls and remnants of barbed wire fences hinting at past use for pasturing of dairy cows, although the fields were clearly long grown in. After a little over a mile, I came to a T in the trails, joining a trail referred to as the Sugar Road on my map, and it also looked like a long grown in road of sorts. 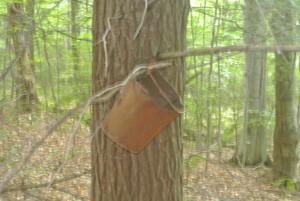 I came across a few rusty old buckets hanging from the limbs of hemlock trees, and I assume that they were long abandoned sugaring buckets hung up for amusement rather than any utility. My camera’s auto exposure settings made for an eerie effect. I went right on this trail, until it merged with an extended series of driveways, and met up with the German Flats road, before beginning my return. I could tell that the trail was well worn by mountain bikers as well as foot travelers, making for smooth running. Returning to the T, I chose to continue on until it met up with a road less than a half mile later. This final section of the Sugar Road trail followed some open fields which must get mowed once in a while, but appeared to be fields of wildflowers (mostly goldenrod) and high grass at my passing. When the trail emerged from the woods into an open meadow, I could see that I had emerged at the end of Marble Hill Rd, which climbs up to this point from Rt 17. Looking at these meadows from the perspective of Google Earth, I could see that they were not contiguous with the lower open fields and their associated farm house, leading me to believe that I was on an abandoned hill farm. 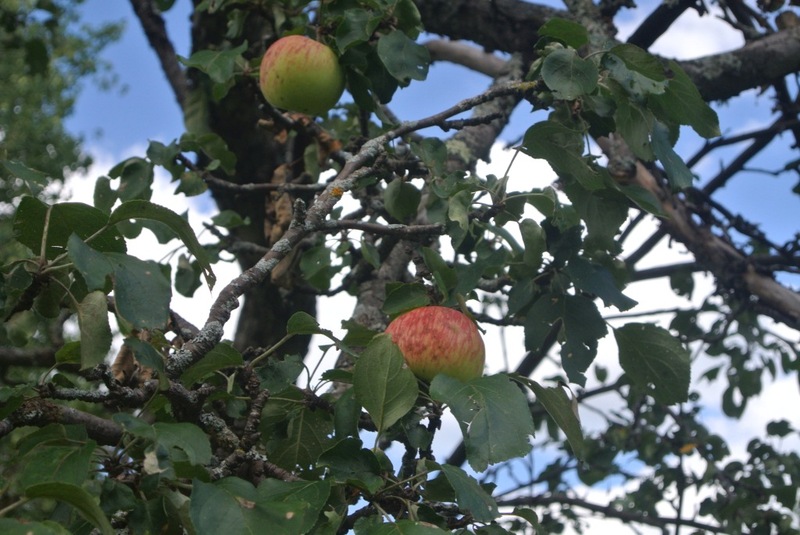 My suspicions were further reinforced by the presence of a few ancient apple trees, one of which grew some of the more interestingly colored apples I have seen. 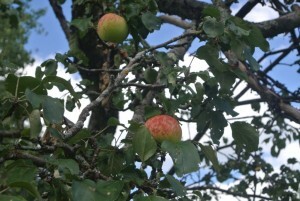 I can’t help but wonder if these are some long- lost heirloom variety, or something more well known to apple aficionados. 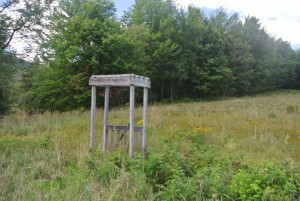 There was also an odd wooden structure, standing out in the field like some ancient monolith, and I could not discern its former function. After enjoying the sights of this meadow, I returned to the T, and descended to my car, with a slight variation at the end down a section of trail which was clearly built for the pleasure of mountain bikers, with tight banked curves and a moderate pitch. This section of trail returned me to the Mt Ellen access road, forcing me to run a few hundred yards uphill to the parking lot where my car awaited me. All in all, this was a pleasant, not particularly difficult run of slightly less than 5 miles, with maybe 500 ft of total vertical climb and descent. I enjoyed how this run sent me through sections of forest where elements of past and present habitation and agriculture were readily seen, but I could also see the effects of wilderness slowly taking over. Thanks for the shout out. We are so glad that you enjoyed the Valley’s trails. Much of the area where you ran is part of Marble Hill Farm, which is in the process of being conserved by Vermont Land Trust. As part of that project, we will be developing several new trail loops around the farm. We hope you’ll come back again in a year or two, once the new trails are complete. And thanks for reading my blog and commenting – I have enjoyed other runs on sections of the Mad River Path closer to the River itself, and look forward to coming back to this section as well. I presume that the Marble Hill Farmhouse is the one, just down the hill from where I turned around at the the end of the road? I assume also then that the fields at the top of the hill where I was are associated with this farm, even though they don’t look like they actually connect with the farmhouse’s fields, at least according to Google Earth? You are correct, the white farmhouse is the Marble Hill Farmstead and the fields closer to the top of the hill are part of it as well. The farm also includes a large amount of woods.